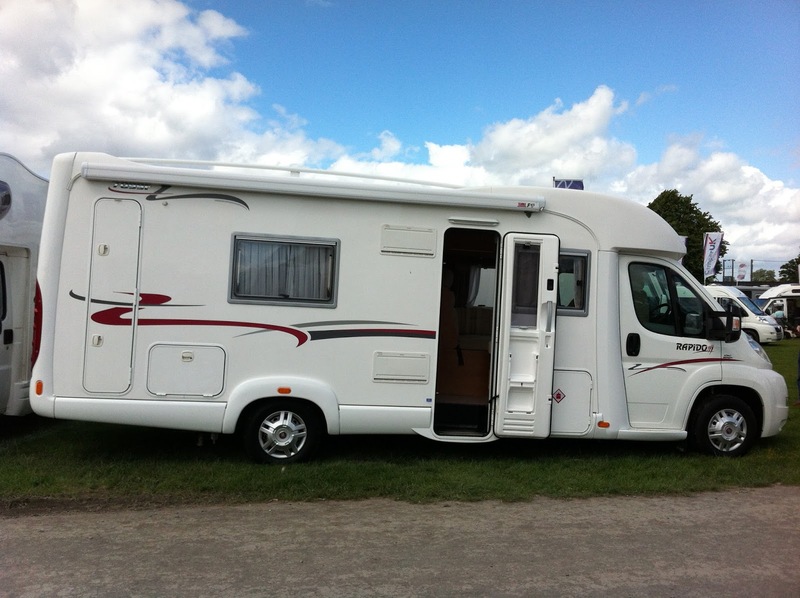 We visited the UK Motorhome Summer Show on Saturday 30 June. Held at the Agricultural Showground, a large number of motorhomes had camped out over the weekend. We arrived at about 0930 and after a cup of tea and a bacon roll (doughnuts for Cathy! ), we had a wander around. There were a few stalls selling the usual gadgets and accessories, many of which we're sure we can live without, but more about the useful gadgets and ideas later. 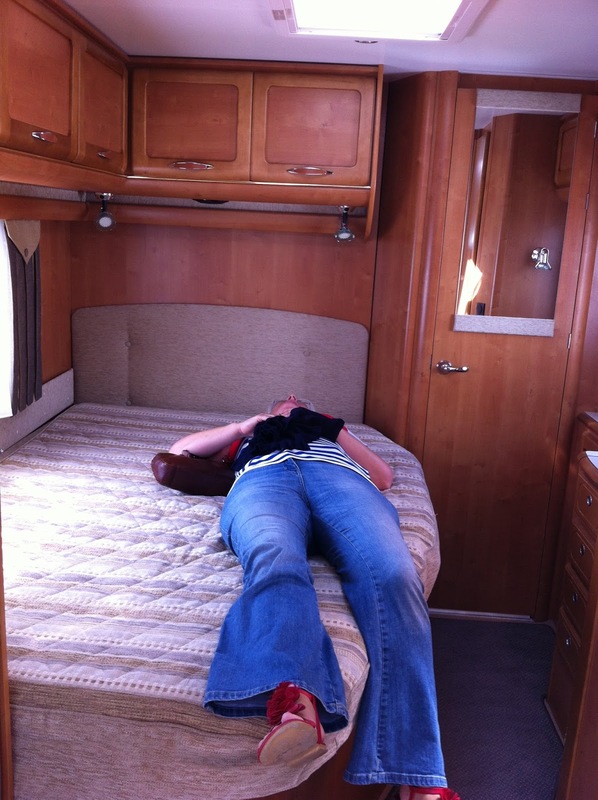 The majority of motorhomes on show were secondhand from a number of dealers around the UK. 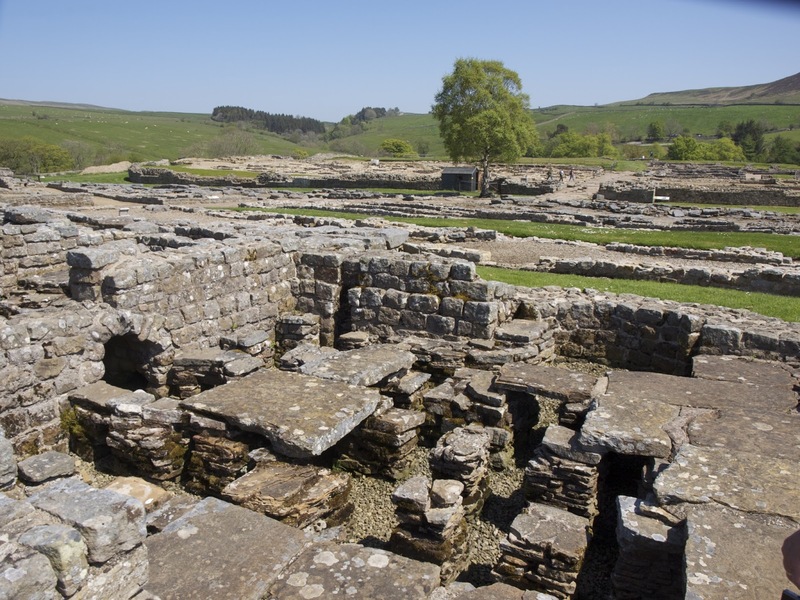 It was interesting to compare layouts and sizes and, having learnt lots during our week's hire in Northumberland, we felt much better equipped to judge what we liked. Many of the older motorhomes were quite tired (or "well-loved" depending on your view!). However some of the newer ones were quite interesting. Having read lots about Burstner vans, we were quite disappointed with their layouts - given their high price we're unlikely to pick one of these. 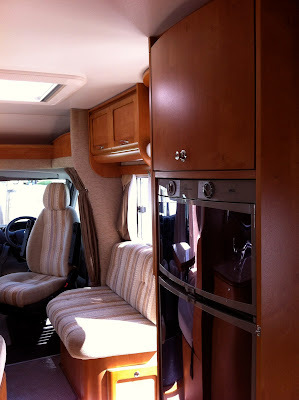 We visited a Chausson which still impressed with the quality of the finish. Having talked about buying a motorhome with fixed single beds, we're now turning back towards a fixed double french bed, especially as we found a few with more space around the bed. In particular we were impressed by the Rapido 7099F. This has a very similar layout to the Chausson Welcome 85, with an L-shaped galley, large fridge and freezer, comfortable seating and lots of storage space. 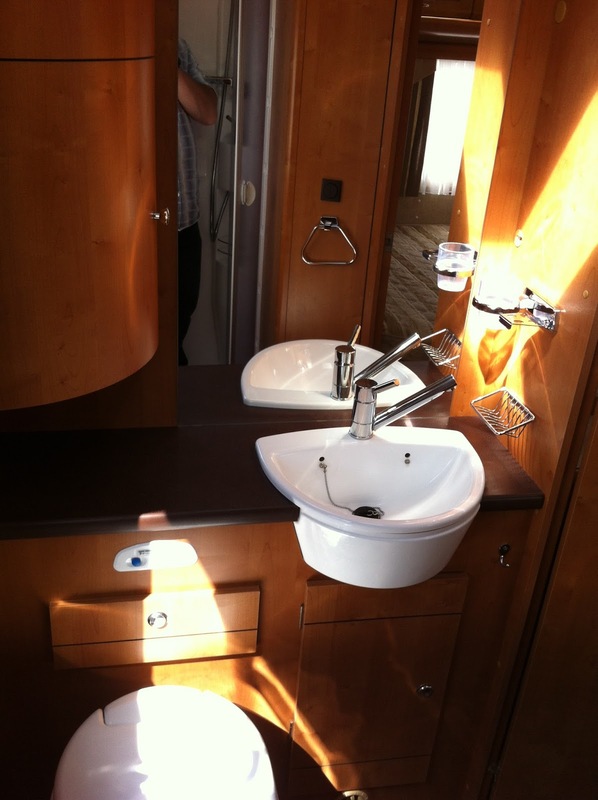 What really stood out was the large bathroom, which was at the rear and across the whole width of the van. This meant that the french bed could be accessed from one side also, which made the sleeping area seem very open, light and airy. 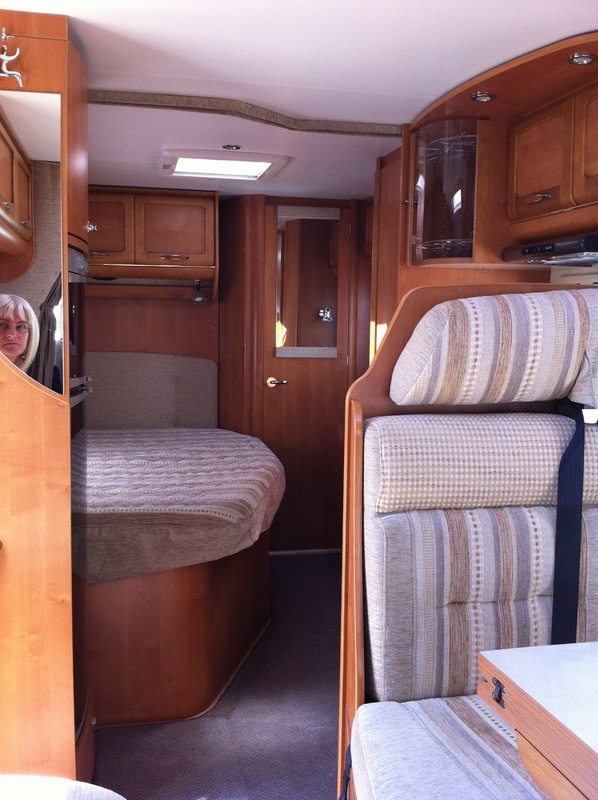 However this motorohome, at 7.40m long, might be too long for us as a first purchase. On the other hand, we're planning to eventually tour Europe for several months, so the additional space might be welcome. We were pleased to meet up and chat with the Britstops team. Having experienced the France Passion idea, they thought this would work well in the UK, where motorhomes are not made welcome pretty much anywhere but campsites. This service offers free stopovers at all sorts of venues around the UK, including pubs, farms, vineyards and breweries. Although the stopover is free, the hosts hope you will try their produce and services. You have to pay for the Britstops Guide (and window sticker) but then have access to over 140 sites and we were told the list continues to grow. 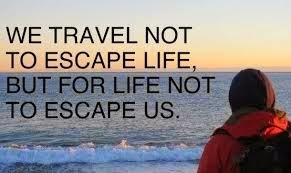 With the relatively high price of campsites in the UK, wild camping prohibited and with very few overnight camping car parks or Aires, we think Britstops will take off. It was also great to meet Adam who, with his his girlfriend Sophie, spent a year travelling through Europe, recording their travels in their Blog - Europe by Camper. Adam was very enthusiastic about both their trip and their new business venture to provide internet connectivity when on the road - Motorhome WiFi. We were particularly impressed with their iBoost WiFi System. For people like us, who want to connect to the internet over wireless using a number different devices, this booster system to connect to wireless hotspots is ideal. Lots of sites and local cafes, bars and resturants offer WiFi, however you have to find and visit them, so having internet connectivity via a secure private network in your motorhome is just what we're looking for. I like to update our blog daily where possible, including uploading photos, so having the option of doing this sat comfortably in our motorhome (or outside with a cold beer!) is just what I'm looking for. Although there's the capital cost of buying the iBoost WiFi system, I think the convenience will soon pay for itself. 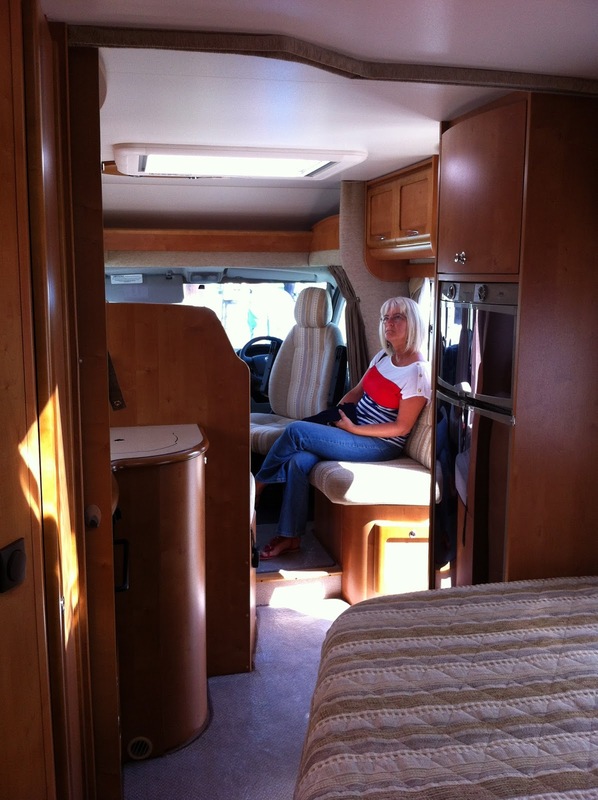 When we have our own motorhome we'll certainly be looking at buying one of these systems. We wish Adam and Sophie all the very best with their business venture - we think it's a winner! 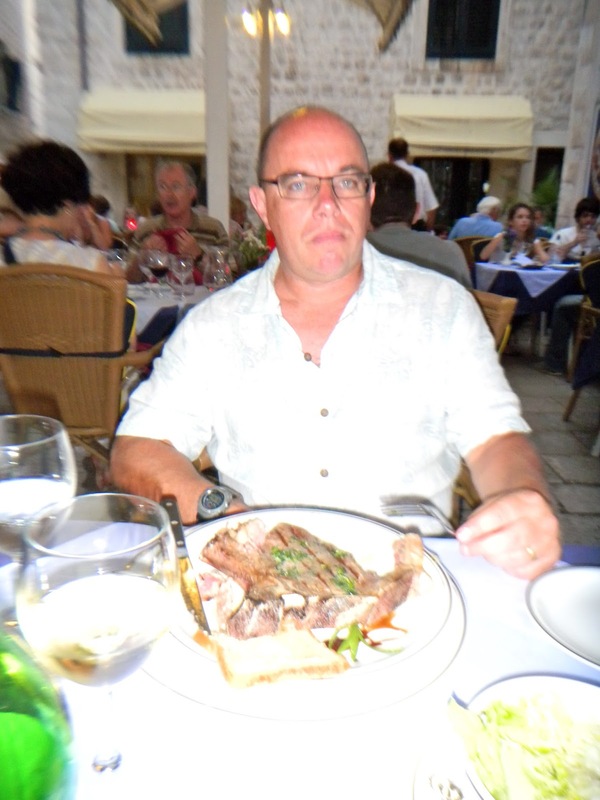 We're off to Dubrovnik for a short break in a couple of weeks to celebrate Paul's 49th birthday but will be back in time to visit the Nothern Motorhome Show in Tabley near Knutsford, just a short 10 minutes drive from our home. We also received our NEC Motorhome tickets in the post last week - more opportunities to visit motorhomes and dream! Our final morning and we awoke to clear blue skies and very hot sunshine, even at 0730 as we sat outside having breakfast. We could easily be in France on a summer’s day; we’ve been very fortunate with the weather this week. 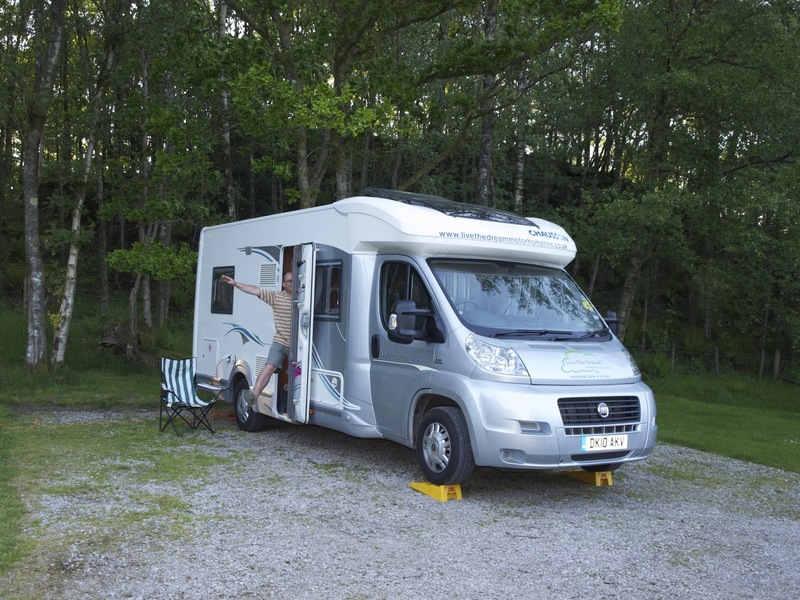 This has been our favourite site so far, just 5 pitches hidden away through a wild grass meadow and amongst the trees, but still with the motorhome servicing facilities, and half the price of the others. Now packing and cleaning, we'll soon be heading south and home. 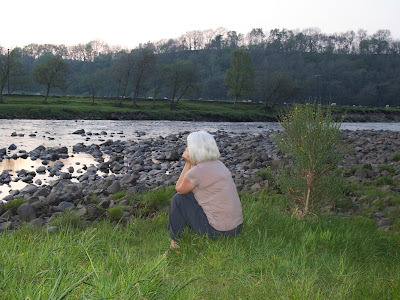 We've already talked about next year’s trip, visiting some of the wild swimming sites in inland France. It's also spurred us on to visit the Motorhome show at the NEC again this year, as we now have a much better idea of the sort of layout we want. And we'll be saving hard to increase the ”Campie Fund”, ready for when we can buy our own. In a few days I’ll add some photos to each of our daily blogs and will also think about a separate piece on what we’ve learnt from our first motorhome trip. It’s been a very relaxing week and this life is definitely for us. 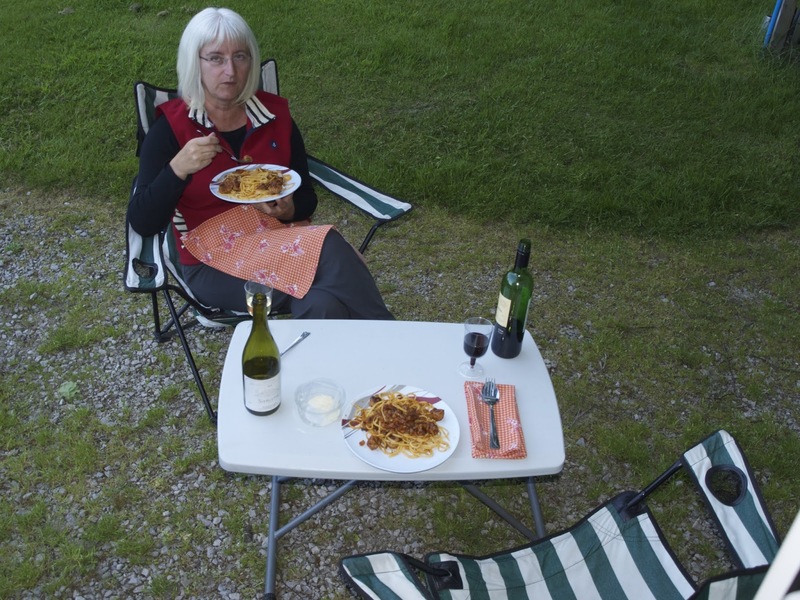 Having quickly set up, Cathy found a place to snooze in the sun as I prepared our last supper. Looking in the fridge & cupboards I cobbled together a bacon, sausage, onion & garlic pasta sauce with linguine, enjoyed with some wine. Our final meal was enjoyed sat outside, listening to the bird song. 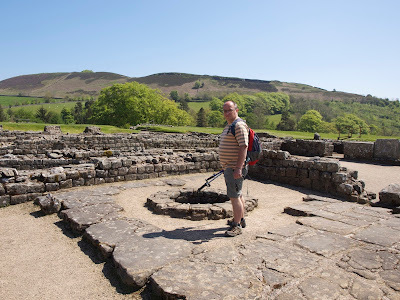 As I type this blog from our last full day, and as Cathy washes up, we both look back and realise how easily we dropped into this nomadic life of motorhoming and how we look forward to further adventures. It will be hard tomorrow to hand Campie back to its rightful owners but, for us, this is very much the end of the beginning. It's been a fun and life-changing week. Having left Waren Mill we headed up the A1 to Holy Island. There was quite a lot of sea mist and this continued to roll in on and off throughout the day. Crossing the causeway from the mainland was surreal, a bit like stepping back in time. Again motorhome parking was well catered for with plenty of room to park and manoeuvre. Another good point to note is that the parking tickets are valid in all the main tourist stops along the coast, so a day's parking for one site (£4.40) can be used if you move to somewhere else that day. On Holy Island we visited the Priory Museum and the Priory and then walked up the road towards the castle. Again, it looked quite spooky as the island appeared and disappeared as the mist rolled in and out. We didn't visit the castle but did walk up to the Gertrude Jekyll walled garden, which was a disappointment - perhaps we were too early in the season. But Paul did manage to 'obtain'a couple of sprigs of rosemary for our lamb tonight! Cathy also gathered 5 different sized flat stones to build a Holy Island cairn in our garden - it's a white witch thing! Leaving the island we headed for Bamburgh and parked easily in the large car park opposite the very impressive castle. We walked into the village and visited the RNLI Grace Darling museum - well worth a visit and it’s free although they welcome donations (I support the RNLI). Walking back we bought some famous Bamburgh Bangers from the butchers, plus some fruit & peppers from the green grocer. Bamburgh also has a number of lovely cafes, pubs and gift shops - well worth a visit. Returning to Campie it was time for Cathy to drive for the first time; it was a 2 hour journey along a busy A1 & A69, then a narrow and steep approach to the site at Haltwhistle. She did REALLY well and it's good to have a co-driver to share the load. 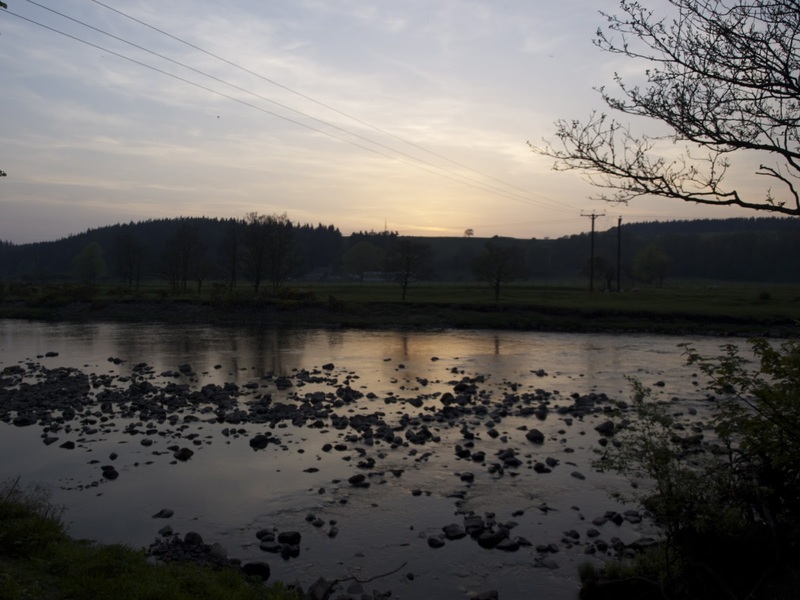 The site is very peaceful, nestled in a valley amongst trees on National Trust land, and alongside the river Tyne. I’m sat in a very warm sun as I type; the brew has gone down well and Cathy is now giving me the "is it G&T time?" look, so I’ll sort that out then prepare dinner. Smoked salmon starter for me, smoked kipper pâté for Cathy, then BBQ’d lamb chops & Bamburgh Bangers, with a salad, no doubt followed by some birthday cake. Tomorrow we're visiting Hadrian’s Wall, starting at Vindolanda Roman fort (or, as I call it, Vindaloo), before our final night at a small site at the very southern tip of Lake Windermere.